Mariners Latest: Who Has A Chance At Throwing Next No Hitter? Anyone Facing The Mariners! Who Has A Chance At Throwing Next No Hitter? Anyone Facing The Mariners! Yes, it's been that bad. The Mariners have been no hit deep into the last two ball games. First by Oriole pitcher Wei-Yin Chen who went 6 and 1/3 innings before giving up a homerun to Casper Wells. That broke up a perfect game bid. Yesterday it was ex-Mariner Chris Tillman who shut the M's down, giving up just one hit all the way to the 9th inning. The Mariners somehow were able to tie the game on Tuesday night with 3 runs in the 8th but quickly gave up a run in the ninth to lose. Last night, in the ninth inning they got on the board for two runs but came up short in a 4 to 2 loss. Too little, way too late. So we've built a team on pitching and defense. Our pitchers do alright at home, our hitters can't hit at all. Our hitting is way better on the road, and, our pitchers can't pitch. A recipe for disaster it seems. Just last month we saw an undeserving Casper Wells get moved down to AAA Tacoma for a short period of time. Upon coming back to the Mariners roster he has been hitting the ball quite well. Wells has talked about the work he put in down in Tacoma and how it has obviously paid off. My question is; Why can't we do this with others? Justin Smoak, Jesus Montero, Dustin Ackley and now, Kyle Seager and Michael Saunders could even take a look at a few things. Could it be that the hitting instruction in the minor leagues is more helpful than the hitting instruction being given to the Major League ball club? It makes me wonder. Now more than halfway through the season and approaching the All-Star break, the Mariners are a distant 16 games back in the A.L. West and 14 games under .500, trailing the Oakland A's by 7.5 games who are just a game under .500 on the year. Really? The Oakland A's? If there is any reason to come unglued and want to totally jump off this patience train, this is it. The Oakland A's are not a team that we should be behind this year. For that alone, we should be making changes. Going through the Twitter feed last night I came upon some interesting news. Carlos Peguero has hit 5 homers in his past 5 games. Peguero, a welcomed sight for me when he joins the club due to his ability to hit a homerun any time he comes to the plate. A bit of a Richie Sexson approach, but hey, I'll take that any day over watching the past two games. He's hitting .293 with 18 homers in 49 games for the Rainiers. I know it doesn't usually translate that way when they come up to the big leagues, but why not give the guy another shot? So far, the Mariners have given us less than what they promised. They have given us a need for a lot of patience, they have given us a lot of youth, but what they haven't given is a team that is competing every day. Most days we are barely surviving out there and becoming a laughing stock around the league. Since the perfect game by Philip Humber, the Mariners have been too close to having that repeated by far too many pitchers since. Now, if it weren't bad enough, Franklin Gutierrez, Erasmo Ramirez, Kevin Millwood and Jesus Montero all went down with injuries this week. 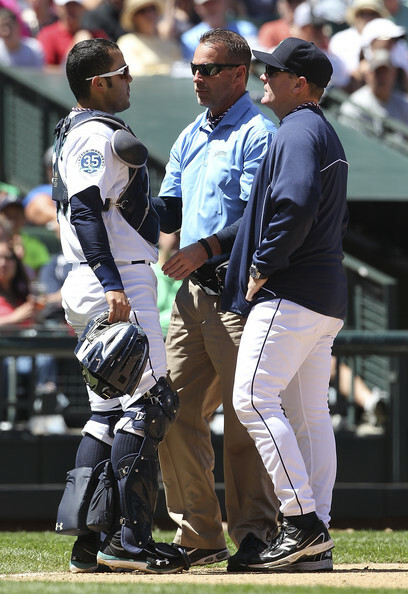 Guti with a pick-off attempt that went off his face hit the 7 day DL with a concussion, Ramirez hurt his elbow, Millwood hurt his groin muscle and now Montero is out momentarily with a slight concussion. Montero was hit in his catchers mask on a foul ball that totally rocked his dome. He exited the game yesterday saying that he was dizzy and is questionable on when he'll return. So, an unhealthy squad, an even unhealthier batting average at home of .194 and our team leader in average is hitting just .262. Not even Ichiro can hit anymore. That didn't happen until Wedge and his new regime showed up. I start to wonder if this new hitting coach is trying to do too much with these guys rather than just let them play. It seems odd that this team is really this bad and one has to wonder, one has to question. Even your everyday AAA team should hit better than these guys, what's the problem?